Description: This digital stamp is dedicated to all the people out there that keep our country moving. I'm talking about our truck drivers that spend much of their time on the roads, hauling goods from A to B and back again. For your convenience I've drawn the digital stamp with the driver on either the left or right side, depending on what country your from and what side of the road your traffic drives. For a very quick and easy project you could use the coloured version which is included. 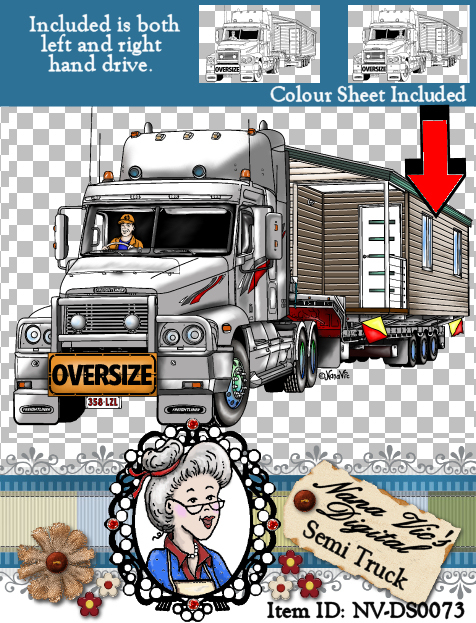 As there is a house on the back of this semi truck I might also suggest besides the obvious trucker themes, projects that revolve around; moving house, moving interstate or just keep on moving. The automatic download contains a 4 digital stamp in both JPG and semi-transparent PNG files. JPG cover image. 4 coloured card toppers in both JPG and semi-transparent PNG files. All files are in 300dpi for easy resizing or flipping.